Picture it. Crystal turquoise water, hundred year old architecture, and beautiful whitewashed buildings all located in a quaint and stunning town. It’s not a dream, you can find this exact picture in the coastal city of Polignano a Mare Puglia, in Italy. Located on the Adriatic Sea, Polignano is south of Puglia’s capital city Bari. 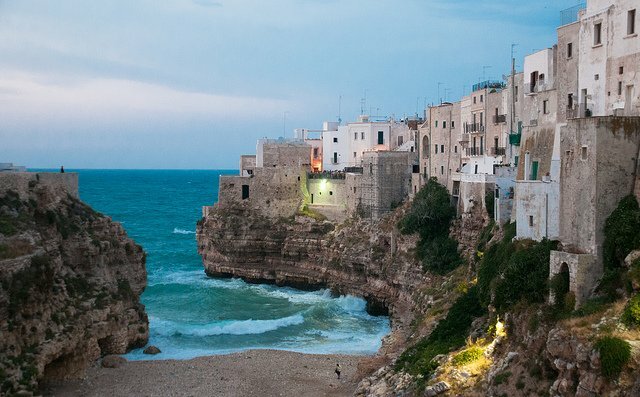 Bari is visited frequently by tourists while Polignano is generally overlooked. 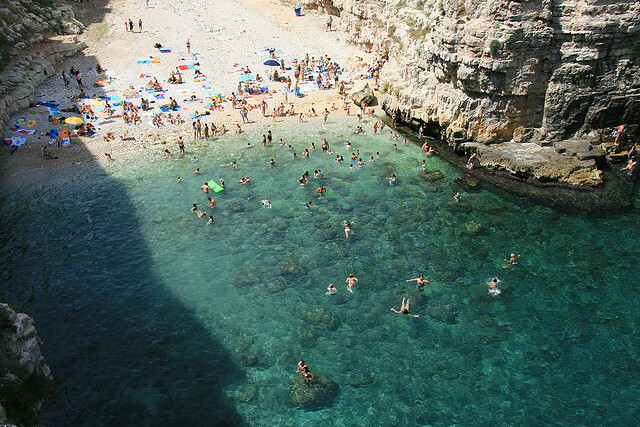 But the real treasure in Polignano (aside from its amazing people) is its beach. In the summer time you can find tourists and locals alike sprawled out on the rocky outcrop of this Italian beach. Enclosed by decrepit structures and ancient cliffs, Polignano’s beach takes visitors back in time to a carefree existence. You can sunbath, snorkel, or even cliff jump all from this gorgeous location and charming town. The short train ride from Bari is well worth your time to experience this breathtaking beach. The best time to enjoy Polignano is in early summer or late spring when tourists are at a minimum and the weather is still nice enough to thoroughly enjoy the water. Put this city on your ‘to do’ list while you are in Italy and head straight to the beach once you arrive.